If we just dropped the concept, "evil," what would replace it? I think we do wrong if we fail to try to understand. This is not a matter of justifying harmful behaviors. It’s a matter of seeing what’s really going on so that we can make some response more effective than a blind urge to destroy. Why are there sociopaths? There are sociopaths because sociopathy is and has been a successful strategy for a certain percent of the population -- i.e., there's a niche for the sociopath in the ecology of human society. It takes a lot of empathetic skill for the cooperation and coordination it takes to develop, design, build, and fuel a truck. But once it's built, there's space for a "free rider" to hop on. That's the sociopath's niche. 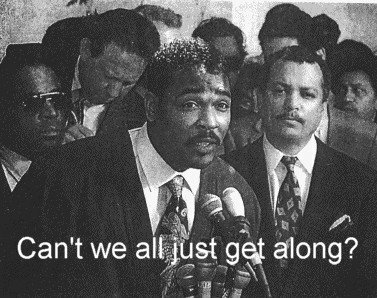 To unpack this a bit, let us put to ourselves the question Rodney King asked: "Can’t we all just get along?" The answer, Rodney, is that we don’t want to get taken advantage of. Throughout our dealings with one another, we constantly face what are called prisoner’s dilemma situations. The classic prisoner’s dilemma gets its name from a scenario in which two prisoners, captured after being in cahoots with each other on some crime, are in separate rooms, each faced with deciding whether to keep mum or turn state’s evidence and rat on their partner. Betraying their partner is in their self-interest, but if they each betray the other, they’ll both be convicted. The overall benefit to the two prisoners combined is highest when they both keep mum – but if one goes out on a limb (keeps mum) for the other, and the other turns state's evidence, then the one who kept mum gets the maximum sentence while the fink gets off scot-free. The strategy of each pursuing their self-interest leads them to an outcome which is not in their self interest. The social world presents us with analogous situations: we’ll all be better off if we cooperate with each other, but often we’re rightfully hesitant to cooperate because we can be taken advantage of, suckered, conned, exploited. Why can’t we all just get along? Because we’re trapped in this prisoners’ dilemma. Cooperation is inherently difficult and risky. Yet proto-humans and humans have been slowly developing ways to provide us with the protections we need in order to cooperate. As our cooperation has grown more extensive and elaborate, we inevitably created space for the free riders and "cheaters on the social contract." This is part 3 of 6 of "Theodicy: Addressing Evil"
Next: Part 4: "Primary Sociopaths and Secondary Sociopaths"
I have a bit of experience with someone who fits the DSM criteria that you list. I think it's not just the free-rider issue. From what I've read (and experienced) there is a hard-wired lack of empathy which keeps one's focus on their self, and only their self. The parts of the rest of us that foster communication and connection do not exist. There's no guilt. There may not even be capacity for it. It's not that there is a niche in society that allows free-riding. There's always that niche and you do not need to be a sociopath to fall into it. Some people do terrible things and regret it later. 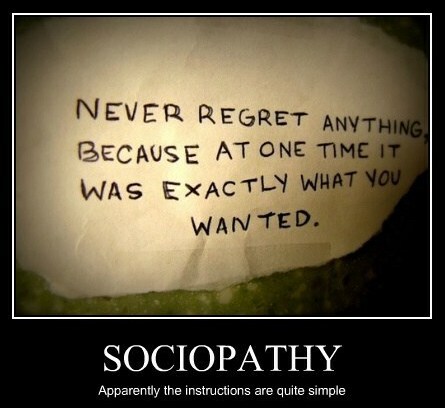 Sociopaths do not. I recommend you read The Sociopath Next Door.